Hello! This is the Devlog for All That I Touch! The basic concept is that you turn objects in the environment to a random colour from your currently selected pride flag. Basically a game where you literally turn everything you touch, gay. Today's just getting the basics sorted out. I'm using the standard Unity 1st Person Controller for convenience, but this will probably be the only instance of not writing something from scratch. I drew up the hands in Paint Tool Sai. The hands are UI images, with the open and closed sprites being swapped out when the mouse button is clicked. 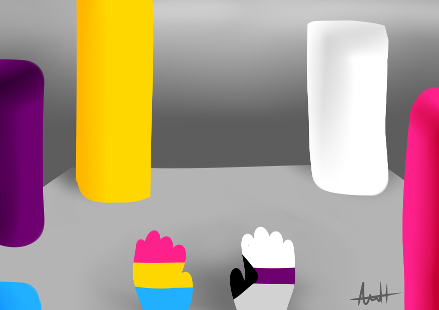 The hands are UI images so they can serve as masks for the pride flags (as shown with the pan flag). Today I got all of the base mechanics done. This involved using arrays to store all of the different flags, what they look like, and what colours each flag has. From here, I made it possible to scroll through the array of flags by using the mouse scroll wheel, and the Q and E keys. Since the game knows which flag you're currently on, it's then a fairly easy process to access the colour array associated with that flag, and get a random colour from it. I used a Raycast to actually affect the material colour of other objects. Didn't do anything for this game. Did a bunch of game feel/positive feedback stuff today. First of all I added a particle effect when you change the colour of something. This especially helps if the colour is white, or the same colour the object already is. To help aiming the raycast, I added a crosshair. It's a heart because this game isn't exactly violent. I also added an indicator of the current, previous and next flags to the upper left of the UI, as suggested by MisterLee! Oooh this looks great ! I love ow it looks like, hands are very cute ! I 3d modelled a bunch of furniture for the game today using Maya. Halfway, I realised that I was modelling objects from my room, which makes sense given that my room is very much "my" space. I've had a question that's been on my mind since the beginning: what colour do I make the walls and furniture initially? Some flags have white and black in them so it can't be either of those. With the revelation that I am creating a game set in an approximation of my room, I elected to have the initial colours be similar the colours my room is in. I'm happy to say that this leaves me very close to finishing my game! I just need to make a main menu, add sounds (or rather, one sound, the colour "shooting") and add a tutorial. Usually I am not a fan of blatant tutorials that tell you what buttons to press. However, I realised that a tutorial would be a good way to frame the game in terms of queer identity. By telling the player how they can change between flags, I am telling them to find their identity, and the flag/label that they feel comfortable with. By then telling them they can change the colour of things to the colour of their chosen flag(s), I am therefore telling them how they can express their queerness upon the world. Not sure if I'll have any time to work on the game today, so I figured I'd make a WIP build with what I have so far. Turns out that cursor locking to centre in WebGL is really finicky (it doesn't automatically do it when the game starts up). For now, aim to have the cursor be in the middle of the screen when it loads. I'll try and sort this out when I have time. Was busy today as well, so I decided to create some sounds when I could. Messed around with http://www.bfxr.net/ for a little while for "shooting" sounds. I also messed around with http://boscaceoil.net/ for music. Problem is that I'm afraid that I'd have to make something really long for it to not sound repetitive, so I'm unsure if the final game will have any background music. Also found out that locking cursor to screen in WebGL is harder than first imagined, at least with the default Unity first person controller/mouse look. As part of my attempt, I made a stand in Main Menu that's actually the same scene as the actual game (since you need a mouse/key press to get cursor lock to work in that scene). I am planning to draw a Logo and perhaps start and quit buttons tomorrow. As of right now I still can't get it to work. I feel like I'm really close though, as it does seem to lock in after you left mouse click after the ui button is pressed. Of course, not having the final build be WebGL is an option but, now I'm trying I kind of want it to happen. Since the last update, I solved my cursor locking problem by using Event Trigger to trigger my would be On Click event on Pointer Down instead. I hooked up the sounds I did yesterday so pressing left mouse button now makes noises when colouring objects. There are four sounds which are chosen randomly. I also did my Menu, and added a tutorial at the start of the game. The quit button is currently really useless but I'll probably make Windows and Mac builds of the game after I kick back and relax for a bit.